African Wildlife Foundation (AWF) and the Alliance for a Green Revolution in Africa (AGRA) have resolved to work together on their shared objectives of improving the socio-economic well-being of Africa and its people. The two Pan-African institutions have a shared vision of a prosperous Africa. While AWF fosters new and innovative solutions to ensure the protection and preservation of Africa’s wildlife and wildlands, AGRA works across the continent to help millions of small-scale farmers and their families lift themselves out of poverty and hunger through agricultural transformation. 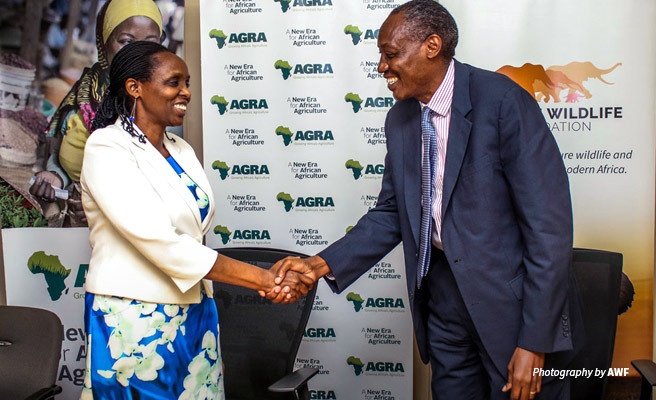 “At AGRA, we believe that investing in agriculture through stronger partnerships is the surest path to reducing poverty, creating jobs and transforming economies in Africa,” said Dr. Agnes Kalibata, AGRA President as she hosted the AWF delegation led by AWF President, Kaddu Sebunya. He said, “AWF works to ensure that wild life and wild lands are part of our modern Africa and that they continue supporting agriculture which has become a critical engine for Africa’s economic transformation." It is vital to protect the delicate balance between agriculture and the environment. “Some of the ecosystem services that are crucial to agriculture include, for example, water provisioning, soil and its nutrients and pollination services offered by bees and other pollinators. Acknowledging this inexplicable link between agriculture and the environment, we welcome the partnership with AGRA,” added Sebunya. Dr. Kalibata said AGRA was committed to working with other organizations on the continent and beyond to transform smallholder farming into a thriving business. “As the first part of our name—the Alliance—implies, we work with a broad spectrum of partners across the continent and beyond to transforms smallholder farming from a struggle to survive to a thriving business. This partnership recognizes that the environment is critical to agriculture. It will enable us to leverage each other’s strengths to ensure that agriculture transformation happens within the planet’s carrying capacity and does not negatively harm the environment. More specifically, we look forward to working with AWF to better understand different agro-ecological zones as we develop and roll-out seed, fertilizer and agronomic technologies that are adapted to these conditions,” added Dr. Kalibata. As agriculture is affected by and affects the environment, the partnership will see the two organizations tap into their mutual strengths in the development and implementation of programs that achieve the twin goal of increasing agricultural productivity and the attendant benefits and safeguarding the natural resource base that underpins a sustainable agricultural system. Grace Wairima Ndungu is AWF's Senior Communications and Advocacy Officer. In this role, she supports the implementation of internal and external communications strategies and helps strategize on ways to promote AWF’s media and advocacy activities.